The Best Invention Ideas are In from Thousands of Families across the Nation. ne family’s invention idea could be another family’s long-awaited solution to a problem they face every day. After all, there’s no one you can relate to more than another family who understands the daily challenges that you must routinely overcome. 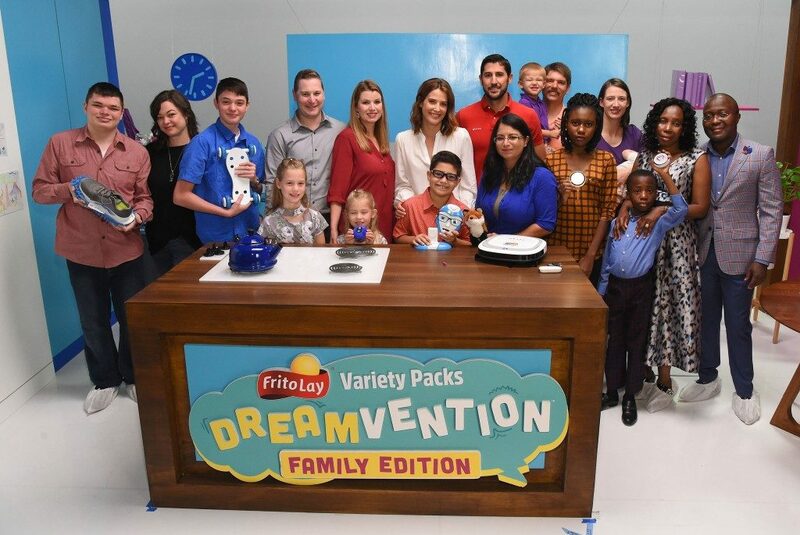 That’s what Frito-Lay Variety Packs, one of the flagship brands from PepsiCo’s Frito-Lay division, sought out to do earlier this year with its Dreamvention contest—inspire families across America to dream big and submit an idea to solve an everyday problem. Thousands of creative and practical inventions were submitted by families nationwide, but only five families’ inventions rose to the top. Today, those five finalists begin their competition to win America’s votes and the grand prize of $250,000. After being selected as finalists, the families had the opportunity to see their dream inventions come to life. Cobie Smulders, “Dreamvention” spokesperson and a mom of two herself, joined the families in seeing their ideas transformed into official prototypes by MAKO Designs + Invent, a full-service consumer product development firm. Their inventions, along with additional information on the families and their inspiration for their invention, are now available for you to vote on at MyDreamvention.com through January 6, 2019. In early 2019, one lucky winner will be chosen and will take home the $250,000 grand prize. Breakfast is the most important meal of the day in the White household, but having two young girls so close to the hot stove made mom Jill a little nervous. Together Jill, Audrey and Mia came up with the idea for Kid Safe Switch, a sensor that when attached to the stove or oven can sense when someone is too close and sound an alert. The invention allows everyone to have fun in the kitchen while mom stays worry free. By participating in Dreamvention, Mom and Dad feel like this has encouraged their girls to think in a new way, try new things and keep raising their hands in class. Like most kids, 14-year-old Parker Frye was tired of walking the half mile to and from the bus stop every day in his rural Michigan town. To solve this problem, without taking up too much space in his backpack, he quickly came up with the Sole Riders, a specially designed shoe that comes with buckle-on attachments to speed up his daily walk. The whole family pitched in to create the design. Mom, Jennifer added ideas for attachments like a mop, to help keep the house clean, and Parker’s big brother Evan helped with the design and graphics for the online Dreamvention submission. Finding your way around the house in the middle of the night isn’t the easiest in the dark. Eighteen-year old Miatta Kamanda knew there must be a better way to finding your way in the dark than having to face the harshness of turning a light on. That’s when Glow the Way was born, featuring a series of circular, LED-powered lights that turn on at night and can stick on floors or walls. Glow the Way lights up your path to the restroom or another bedroom. As a soon-to-be college student studying business, Miatta couldn’t be more excited to see this life-long dream of hers potentially come true. You’re searching through your room and all over the house for your glasses and inevitably, “crunch;” you end up stepping on them. Ten-year-old Evitt is familiar with this problem, and after breaking or losing several pairs of glasses, he and his mom came up with a solution. Sleepy Heads, designed to keep your glasses safe while you sleep, can be used freestanding or attached to a headboard. Evitt has always liked to problem solve and think of new and exciting ways to do things, which is why the mother-son duo is excited to see their invention potentially become a reality. Playing with your kids is all fun and games until it’s clean up time. As a stay-at-home mom, Jacqueline was constantly walking around picking up toys and putting them back where they belong. Often while cleaning up, she thought about how great it would be if she had something to collect all the small toys for her. Jacqueline’s background in engineering and passion for inventing led to the ideation of the Robotic Toy Bin: a gentle, vacuum-like tool that would automate the clean-up of small toys like building blocks, cars and balls. Voting is open from now until January 6 at MyDreamvention.com or through digital display ads. People can vote once a day per platform per browser per device. Once registered, those who place a vote will also be eligible for a chance to win $1,000. The winner will be announced in early 2019. For high-res images, broadcast-quality b-roll and other press materials about Dreamvention, please visit www.magicbulletmedia.com/MNR/DreamventionFamilies.